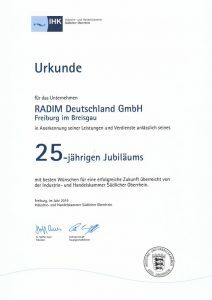 Radim will celebrate 25 years of excellent services and IVD-products for our customers. This year in April my team and I will celebrate this important anniversary. Who in this fast changing business environment can already look back on such a long period of constant support to our clients. No question that even Radim underwent troublesome times. BUT we survived! And are back in the market even stronger than ever. Thanks to the team of Radim Deutschland the company delivers day by day and year after year allergy diagnostics and other IVD kits plus an excellent service, maintenance and telephone support from Monday to Friday. With new products coming soon we will even support more patients with high-quality diagnostics in the coming months and years. But without our clients Radim would not have had the opportunity to manufacture and deliver those high-quality assays. Thanks to all our supporters!!!!! RADIM is moving at the beginning of July 2018! Dear customers, Dear suppliers, In calendar week 27, we move within Freiburg with the entire headquarters including technology center and warehouse in a new building. Especially in the period of 05. we can only be reached up to 08.07.2018 to a limited extent via our telephone system. Please use our email address info@radim.comat this time if you do not reach us. We will get in touch with you immediately. As of the 09.07.2018, our new company address reads: RADIM Deutschland GmbH Oltmannsstraße 11 79100 Freiburg (in Breisgau) Our previous phone numbers including Service hotline and direct dials remain unchanged. We would like to thank you for your understanding and look forward to receiving you in the new building in the near future.